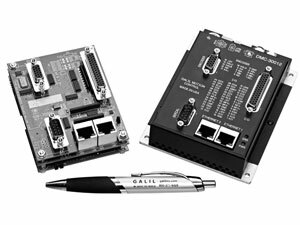 The DMC-30000 Motion Controller Series is Galil's latest generation single-axis motion controller. It uses a 32-bit RISC processor to provide higher speed than older models. The DMC-30000 is available as a compact card-level or box-level unit and connects to a stepper or servo motor amplifier of any power range. Or, the DMC-30000 can be purchased with an internal 800-Watt brushless sine drive or microstepping drive which minimizes space, cost and wiring. The motion controller operates stand-alone or can be networked to a PC via Ethernet.